WikiLeaks, The Anti-secrecy and transparency organization, claims to have obtained the contents of CIA Director John Brennan's personal AOL email account. Also, Julian Assange, founder of WikiLeaks, has promised to publish them soon on their website. Earlier this week, Brennan's personal email account was hacked by an anonymous self-described high school student, who swiped sensitive top-secret data from it. The teenager also posted a partial Spreadsheet filled with the supposed names, email addresses, phone numbers and Social Security numbers (SSNs) of 2,611 former and current government intelligence officials. Anonymous Teenage Hacker is motivated by opposition to American foreign policy, particularly in respect to the Israel-Palestine conflict, according to an interview. The Central Intelligence Agency did not confirm whether the hack happened, but the FBI and Secret Services are currently investigating the case. The anti-secrecy group WikiLeaks claims to have released a few documents from CIA director John Brennan's private email account – the group calling the release The CIA Files. 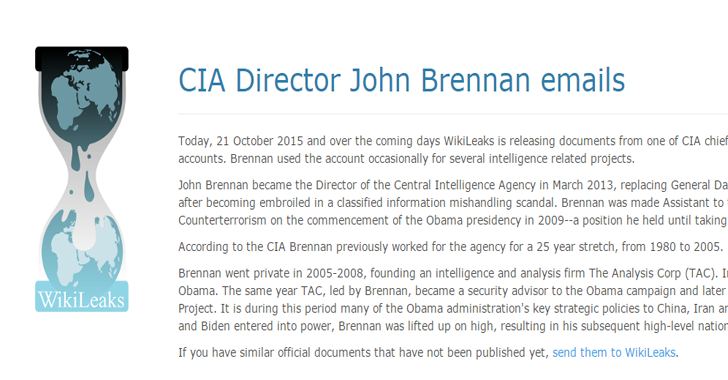 According to the organization, Brennan made use of "the [AOL] account occasionally for several intelligence-related projects," and to support the claim, Wikileaks published six documents. 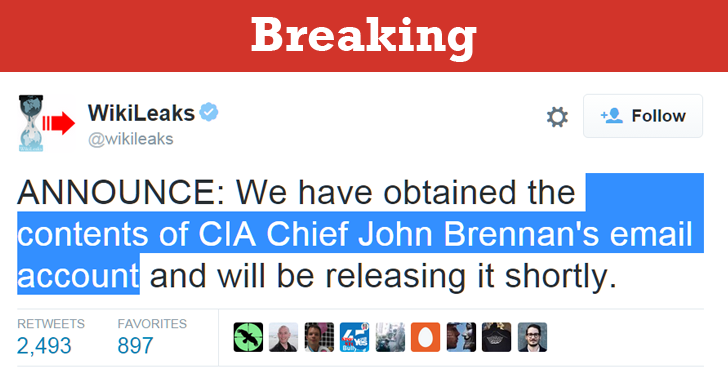 Wikileaks also said the group would release more CIA documents "over the coming days". We will update this news with new information. Stay Tuned to Hacker News Facebook Page.